Hi everyone! As I am new to Chit Chat Café, this will be my first post. I came to Sapporo a few weeks ago. I had visited the city a few times before but always during winter. Now that the last snowflake has melted away, I feel like I am discovering a city that is totally new to me. With the temperatures rising, the flowers blossomed and the leaves back on the trees, I realize how different the city is when Spring comes. I walked around Odori park last week. I sat on the grass (hoping that was not forbidden), and admired the little piece of nature surrounding me. I felt relaxed for the first time in a long long time. Back in Tokyo, I was too distracted to enjoy simple things. That day at the park, I was very happy to be able to step away from my routine for a little while, take a deep breath and re-evaluate the importance of things in life... Have you ever tried? It’s that time of the year for Canadians again, the Stanley Cup Finals. For those not in the know, the Stanley Cup Finals are the playoffs of the NHL (The National Hockey League). The league is composed of 30 teams throughout Canada and U.S.A. Of those 30 teams, the 16 teams that finish with the most points (based on wins and ties) during the 82 game regular season advance to the playoffs. The teams are divided into the Western Conference and the Eastern Conference. The top seed in each division faces the bottom seed in a best of 4 series, with the winner advancing. In order to win ‘Lord Stanley’s Cup’ a team must come up with 16 wins – 4 against 4 different teams. Due to the inherently violent nature of hockey it’s not uncommon for a number of players to get injured during the course of a Stanley Cup run, and with games every two days players often miss multiple games or play with injuries. It’s for this reason that sportswriters often refer to the Stanley Cup as the toughest professional championship to win in sports. For me, this year is especially exciting. My hometown team, The Vancouver Canucks, have advanced to the Stanley Cup Final for the first time in 17 years. During the regular season they finished with the most points in the NHL. However once the playoffs start, everyone starts at 0 again. Now they are now 4 wins away from winning their first Stanley Cup in their 40 year history. About time! The fans in Vancouver are antsy; hockey is more than a passion in Vancouver. In 1994, Vancouver advanced to the Stanley Cup Finals, in game 7, the last game, they lost. That night a riot broke out in Vancouver. This the first year since the riot that Vancouver has been in this last series of the Stanley Cup Playoffs. There is a lot of expectation throughout Vancouver and Canada right now. The Stanley Cup has not been won by a Canadian team since 1993 when the Montreal Canadiens defeated the Los Angeles Kings. It’s time to bring the Cup back to Canada where it belongs! Go Canucks Go! This weekend though I am going to visit the Sapporo Dome for the first time! Nippon Ham Fighters versus Hiroshima Carp!! Which team should I cheer for?? I really love Hiroshima that’s why I should cheer for Carp, but Hokkaido became a part of my life as well, haha. I am really getting to like this sport! After I understood the rules, the sport is getting more and more interesting. The only problem is that I still can’t remember all the names of the Baseball players but that’s only a question of time. Maybe I will meet some of you at the Dome on Saturday?? I'm sorry for my late update of the blog. I was a bit busy. It's already Spring. Time is flying so fast. Did any of you go hanami? Am really happy that the baseball season started and Nippon ham fighters are doing really well. I already went to six games and last Sunday I met (Bobby Keppel and Brian Wolfe) these are two pitchers that play for the fighters. I will show the picture that I took. I hope to see you on Saturday take care. So everyone, golden came and went so let me tell you what I did during golden week. I had plans of going to Otaru, Hakodate and Hohekio onsen. Well did only one of those which was Hohekio onsen. The day me and my roommate wanted to go to Otaru it was raining pretty hard so we decided against it. And as for Hakodate well, it seems that half of Sapporo was there pecause the prices for accommodation were really high and we wanted to go on the cheap side so we'll go another time. Apart from that, I just enjoy meeting some friends and went to a few parties. Now it's Hanami season so I already been invited to a few of them. I always look forward to those because I love being outside and I love drinking. So combine the two and It's a great combination. First one is this weekend on Saturday, after I am done at Chit chat, I will wiz down to Maruyama and enjoy some drinks with my friends. That's it for me, hope you too will go to a few Hanamis! After uploading some photos from the Tajikistan trip to Facebook, I was immediately asked if all of those pics were taken in one country. Indeed, the photos give you a variety of different landscapes as a beautiful view (a sort of remote and lonely beauty) of the Pamir region with its mountains, lakes& rivers (sometimes very swift! ), or a majestic view of an ancient fortress in Hissar, where you will find yourself surrounded by 16-17th century architecture, or a giant sleeping Buddha (6m! ),or some pastures with grazing yaks (ヤク, well adapted to high altitudes and harsh climate of the East Pamir) and a small settlement of a single kyrgyz yurt (移動式テント小屋). Yurts. I am often asked if Kazakhs still live in yurts  Yurt is a transportable dwelling of nomads in Central Asia and Mongolia. It is called by different names in different languages, e.g. in Kazakh – kiiz üi, in Mongolian- ger (probably, the Mongolian version is the most commonly used in Japan ゲル), in Russian – yurta, in Chinese – 包 （蒙古包，毡包）. 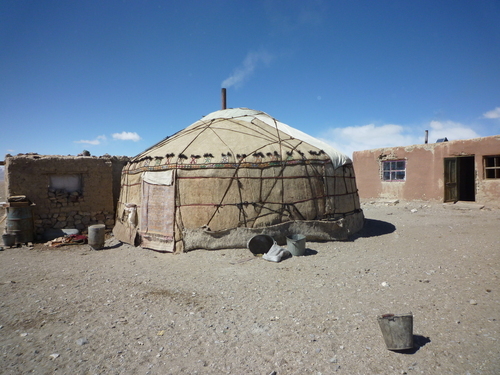 Nowadays, very few Kazakhs live in yurts. However, yurts are still widely used in national celebrations, reminding people their nomadic past.